Liberation Review – Vive la Révolution? For thousands of years, the Dynasty has ruled the galaxy with a tyrannical fervor. Countless planets have fallen under its sway and the Dynasty doesn’t show any signs of stopping in its never-ending quest for expansion and power. The Dynasty must be brought to an end so that peace and freedom can be returned to the people. And the Liberation – a group of rag-tag resistance fighters – are just the ones to bring about this change. It’s a race against time as the Liberation tries to rally the people to its cause before the Dynasty finds their secret base and wipes them out! In the game of Liberation, two players go head to head: the Dynasty versus the Liberation. Each player has different objectives depending on their role. The Dynasty’s goal is to find and destroy the Liberation’s base. The Liberation’s goal is to survive the Dynasty’s efforts for three rounds. These goals are achieved through the usage of a small deck of multi-purpose cards. Each card represents either a location, a Liberation action, or a Dynasty action. It’s a battle of wits as each side tries to achieve their objectives first. The first player to achieve theirs, wins. The setup for Liberation is pretty simple. 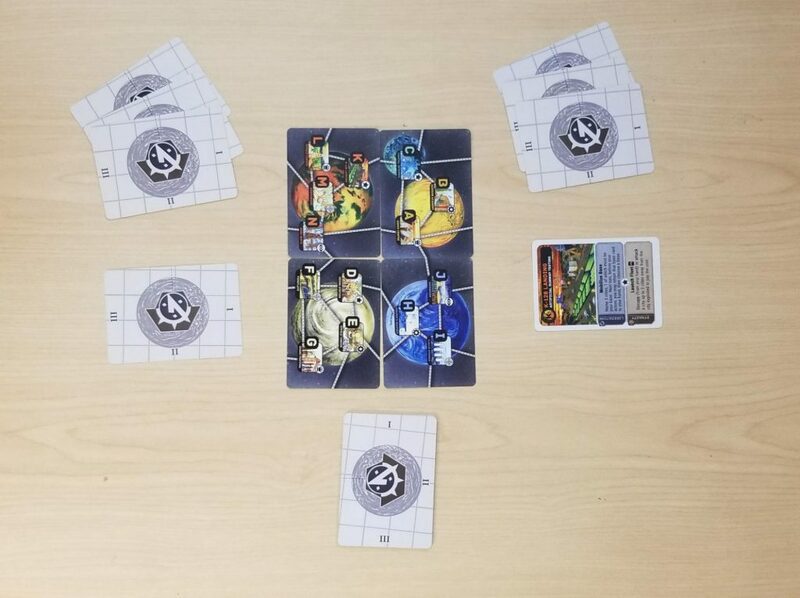 First, the four map cards are shuffled and flipped around and then arranged in the middle of the table to form the galaxy map. 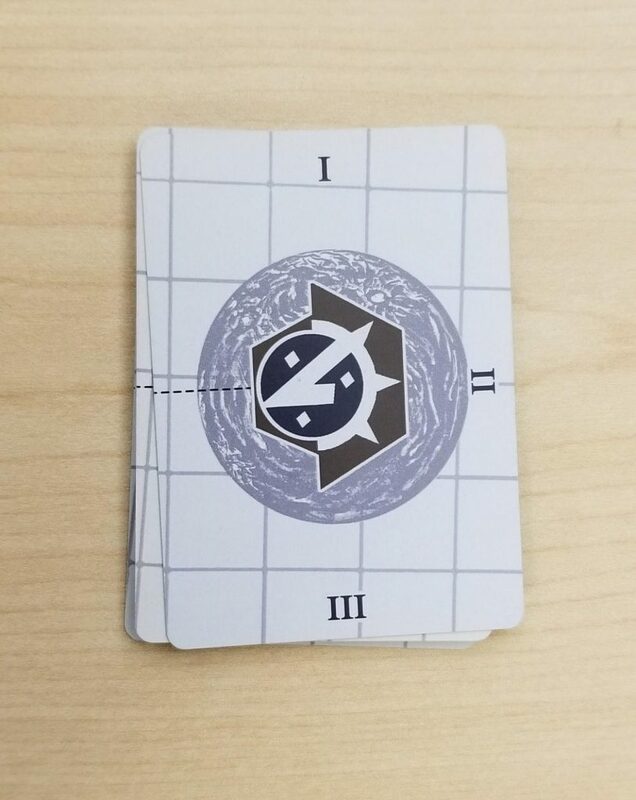 Then all of the other cards are shuffled together into a draw deck with the Roman numerals on the backs of them all facing in the same direction. I recommend pointing the Roman numeral for the current round towards the galaxy setup. These Roman numerals serve as a game timer which will be explained shortly. Room should be left for a face down discard pile. Each player is dealt three cards from this deck. Then the Dynasty draws an additional one and places it face up in front of them: their first occupied city. The Liberation player draws a card and places it face down in front of them, keeping the card a secret. This is the location of their secret base. Then each player is dealt three cards from the deck to form their hand. You’re now ready to begin; the Dynasty player always goes first. Reveal a card from their hand to perform its mission (the text in the Dynasty section of the card) paying any costs associated with doing so. That card is then discarded into the face down discard pile. Occupy: play a card from hand for its location. The location on the card must be connected to the card being exploited. Attack: name a location adjacent to the location on the card that was exploited. If that card is in the Liberation’s hand, the Dynasty receives the card and can either discard it or Occupy it. If the named location is the Liberation player’s secret base, then that player loses the game. Mission: use the card for its mission. The card remains in play. If the mission requires other cards to be exploited, they must be exploited in addition to the mission card. At the end of their turn, the Dynasty player discards down to 3 cards in hand. Evade: return the base card to the player’s hand. Then play either the same card or some other card with an adjacent location from their hand face down as their new base. Sabotage: name a city that is either adjacent to a location on a card in the player’s hand or to the player’s base. If that card is in the Dynasty player’s hand, they must discard it. Mission: reveal a card from their hand to perform its mission (the text in the Liberation section of the card) paying any costs associated with doing so. That card is then discarded into the face down discard pile. At the end of their turn, the Liberation player discards down to 3 cards in hand. If a player would draw a card and there is no card to draw, then the discard pile is shuffled to form a new deck. This deck is then turned so that the next Roman numeral in line is pointing at the galaxy setup. For instance, if the current Roman numeral is I, then the deck would be oriented with the II pointing towards the galaxy. If the Liberation player can survive past the third shuffling of the deck, they win the game. There were a couple of minor issues that I found with the game. Firstly, even though there is a method for determining card distribution, it is not made apparent anywhere in the rule book. The only reason I am even aware of it was that Jason Tagmire of Button Shy Games just happened to be at my local game night and pointed it out. 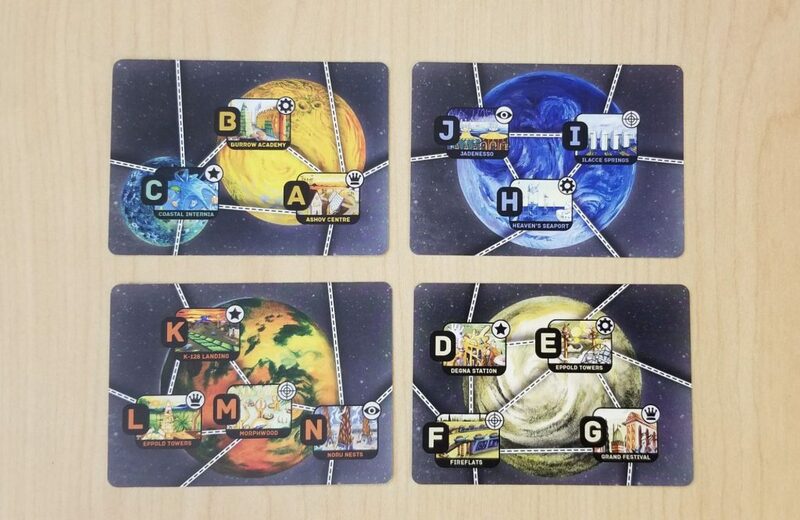 Each different planet has a symbol associated with it and each of these symbols appears on the various cards. All of those cards contain the same missions for both factions. So, since there are three crowns in the galaxy setup, for instance, then there are three cards with crowns on them in the deck. I wish this had been made more explicit in the rules. Secondly, the various actions such as Attack, Sabotage, and Evade all rely on the person that is either performing or being targeted by the action to be honest and forthright. Other than forcing the players to show their hands or recording each and every action taken in a log and going over it with a fine toothed comb later, there is no way to prevent another player from being dishonest with you. While I trust the people that I played the game with, I do realize that the potential for cheaters to thrive exists within the game. These are minor issues, but at the heart of the game lies a much more major one. It is an issue of balance. In all of the games that I have played, The Liberation easily won and that bothers me. Because The Dynasty can only easily expand its boundaries to bordering locations, this necessitates that the Dynasty actually have those location cards in hand. The only way around this is to use the “Launch Fleet” mission which only appears on a total of 3 cards. Once again, being able to use this ability to circumvent the border restrictions necessitates actually having one of these cards in hand. And there are way too many times that you simply do not. To further hinder The Dynasty’s efforts, most of the Dynasty’s other missions require at least 2 occupied locations be exploited in order to use the ability. With The Liberation constantly exploiting The Dynasty’s locations, The Dynasty player quickly gets locked into a situation where the only thing they can do on their turn is to un-exploit things only to have them almost immediately exploited again. Liberation seems to be heavily swayed to The Liberation player and it is because of this that I find myself not enjoying the game as much as I originally thought that I would. The balance just isn’t there to make this fun for anybody other than the non-Dynasty player. I wish I could extol the virtues of Liberation, but I cannot. The game just leaves a bad taste in my mouth. Were it not for the imbalance issues, it would be a different story. When only one person’s having fun, that’s no fun for anybody. IT support specialist by day, Minecrafter by night; I always find time for board gaming. When it comes to games, I prefer the heavier euro-game fare. Uwe Rosenberg is my personal hero with Stefan Feld coming in as a close second. What is a meeple? In the board game world, a meeple is a game piece that represents each unique player. At Meeple Mountain we strive to represent the unique and diverse members of the board gaming community while also providing the summit of reviews, editorials, and events. Looking for a board game gift for a loved one in your life? Our 2019 Board Game Gift Guide has suggestions for all types of games, and gamers! You're sure to find something your loved ones will enjoy! Check out the winners of our first annual Diamond Climber Board Game Awards.